Since the early nineties, Pivot Industrial Training has been assisting clients throughout BC and Alberta to be in compliance with mobile equipment regulations and safety standards. As the needs of our clients evolved over the years, we have expanded our services. In addition to lift truck operator training, we offer safety training on several other types of mobile and material handling equipment. Our clients appreciate the timeliness and flexibility in which we respond to their safety needs. We also pride ourselves of offering customized onsite training on multiple topics and varied equipment within a short response time. Our trainers are members of the CSSE (Canadian Society of Safety Engineers) and the CMHDS (Canadian Materials Handling and Distribution Society). Our clients benefit from all are trainers’ regular participation at these society meetings and conferences as they enable us to stay current on new safety theories and processes utilized in warehousing and construction today. We are continually developing and updating our training materials to ensure our clients continue to learn and benefit from the most current research and best safety practices in the industry. 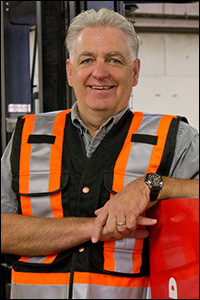 Grant is the founder and president of Pivot Industrial Training Services Ltd. With over 35 years experience in the material handling industry, he brings a wealth of knowledge and expertise to our clients and staff on all aspects of mobile equipment. After obtaining a certificate in Electronics Technology from DeVry Institute, Grant accepted a field service technician position with a national equipment distributor. He worked his way through the ranks to become one of the company’s youngest Managers of Technical Services where he enhanced his leadership and technical skills. Grant’s passion for teaching and safety training evolved when he was recruited as an instructor by an international provider of mobile equipment training. During that time, Grant was promoted to Chief Instructor. He created and co-authored a number of safety training programs on mobile equipment which continue to be sold throughout the industry in Canada and the US. A most noteworthy accomplishment was assisting with the development of the CSA B335-94 operator training standard and being influential in its adaptation by WorksafeBC in the late 1990’s. 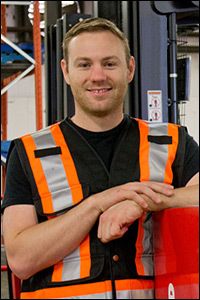 Over the years, Grant has also volunteered as a judge and Chief Judge with several forklift competitions throughout North America. Grant’s current goals are to continue to grow the company by creating strong client relationships and ensuring that Pivot’s staff upholds the quality service that our clients have come to expect. David is the Vice- President of Pivot Industrial Training Services. He has spent the last five years as the company’s head instructor. During that time he was responsible for training all sectors of industries that use mobile equipment. David is well versed in WorksafeBC, Federal regulations and the Canadian Standards Association standards pertaining to mobile equipment and its use in the workplace. David’s strength is his ability to develop multiple custom training courses to meet employer specific requirements involving specialized machines and unique working environments. 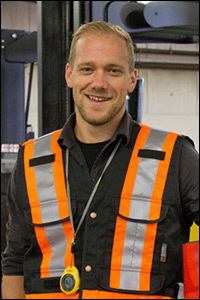 David is a member of the Canadian Society of Safety Engineers (CSSE) and the Canadian Material Handling & Distribution Society (CMHDS) and is a judge for the BC Championship Forklift Rally. As the Vice President, David holds himself and all employees accountable to the high standards and professionalism that Pivot was founded on, and strives to maintain the company’s impeccable reputation for customer service and satisfaction. Pivot welcomed Drew to the team in July of 2011. His resume consists mostly in the restaurant industry with The Keg Steakhouse & Bar. Some highlights of those experiences was being an opening manager for the twelve million dollar, 26,000 square foot location in Yaletown. Drew helped lead the training and development for the restaurants entire service department, which consisted of 90+ employees. He also designed and developed the ‘NLS Training program’ for front of house staff which is now being installed and implented company wide across Canada. Drew has experience operating industrial equipment during his time spent in northern Alberta working the oil & gas industry and is a member of the CSSE (Canadian Society of Safety Engineers) to help his transition into the industrial health & safety field. Drew’s wide range of expertise brings an innovative edge to Pivot which helps to cement us as an industry leader in safety training.